In recent years, gluten intolerance has gotten a lot of attention and there are plenty of good reasons for that. Gluten intolerance is a relatively common issue that involves a person’s body having some sort of reaction when the individual eats protein that’s found in wheat, barley, and rye. About0.5 – 13 percent of peoplemay suffer from non-celiac gluten intolerance. Approximately one percent of people have celiac disease, which is a more serious kind of gluten sensitivity that can cause damage to the digestive system. Although gluten sensitivity does have a long list of possible symptoms that may seem overwhelming, the news isn’t all bad. That’s because you can get tested for gluten intolerance and adopt a gluten-free lifestyle if you are sensitive to gluten. By adhering to a gluten-free diet, you can avoid experiencing the symptoms associated with the condition. If you suspect that you have gluten intolerance, you don’t even need to visit your doctor to confirm your suspicions. You can simply go on an elimination diet instead. An elimination diet involves removing all the things that contain gluten from your diet for at least 30 days. At the end of 30 days, you’ll reintroduce gluten into your diet. If you feel much better when you’re not eating gluten or much worse when you reintroduce gluten into your diet, it’s quite likely that you have gluten intolerance. It’s important to note that gluten is a very large protein. Because it can several months or even years for gluten to completely evacuate your system, the results of your elimination diet will be more telling the longer you stay away from gluten. Your doctor may also order some genetic tests to determine if you’re sensitive to gluten. Your physician may schedule an intestinal biopsy as well. 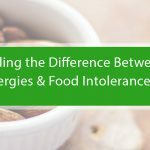 There is also food intolerance and sensitivity testing to consider. Clearly, your diet is very important if you have gluten intolerance. Of course, there’s aright way to dietand there’s a wrong way. If you want to change your diet for the better, we can help. Dr. Weight Loss of Atlanta has been helping people lose weight responsibly for years and we’ll be happy to help you adopt a gluten-free diet. Start your journey toward a gluten-free, healthy lifestyle by contacting Dr. Weight Loss of Atlanta now and schedule a free consultation.